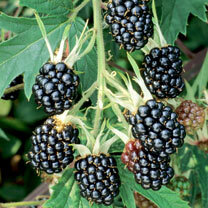 Why Grow your own Blackberries? Blackberries are simply an amazing little fruit, not only naturally sweet, cholesterol free and low in sodium and fat they are packed full with healthy vitamins, minerals and antioxidants such as Vitamin C and E, protein, iron, fibre, calcium, magnesium, phosphorus, potassium and zinc. A true challenger to the mighty Blueberry. 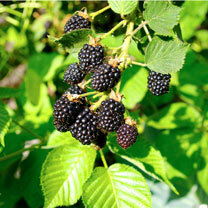 Blackberries love our climate and with the right variety will produce bumper harvests. 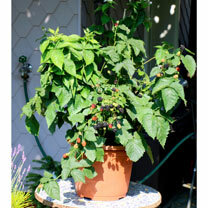 When planting in the garden make sure to tie the plant to a support and it will flourish, making sure to remove any old fruited sections and retie new ones to a support. Only the best variety selected from Dobies of Devon. We have taken the hard work of finding the tastiest and bumper cropping varieties and only stock top quality plants guaranteed.